Whether you are missing some or all of your natural teeth, you can derive many benefits from replacing them with full or partial denture. Replacement teeth help fill out your smile by giving support to the cheeks and lips. Replacement teeth create a more youthful, vibrant appearance by holding up facial muscles and aiding in speaking, chewing, swallowing, and smiling. You may find some minor speech differences with your new appliances, however, Dr. Hopkins will be explaining to you some simple, at-home techniques and therapies to overcome these differences. You may also find that you occasionally bite your tongue or cheek until you get used to having the spaces filled. We recommend that you start off with a semi-soft diet, avoiding sticky or hard foods, and cut your food into smaller bites (half your normal bite size). To clean your new teeth, use a soft bristle toothbrush and toothpaste specifically designed for dentures to avoid scratching the surfaces of your appliances. 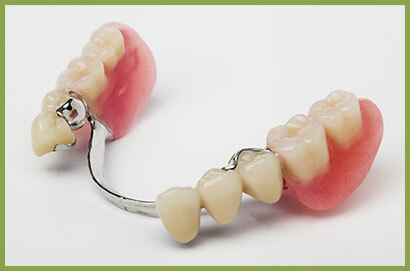 Your dentures should be brushed twice a day and should be soaked in a denture bath overnight. We do not recommend the use of denture adhesives unless it is absolutely necessary. Using a denture adhesive may make the dentures fit incorrectly. Why Do I Have To Take My Teeth Out At Night? Taking Your partial of full dentures out at night is a part of good oral hygiene. As your appliances are in during the day, they are constantly pushing against the tissue and squeezing the tissue fluid out of your gums. This deprives your gum tissue of the nutrients, oxygen, and blood flow necessary to maintain a healthy mouth, and causes the bone to deteriorate and shrink. The American Dental Association recommends that every patient leave their appliances out of their mouth for at least 8 hours every 24 hour period. 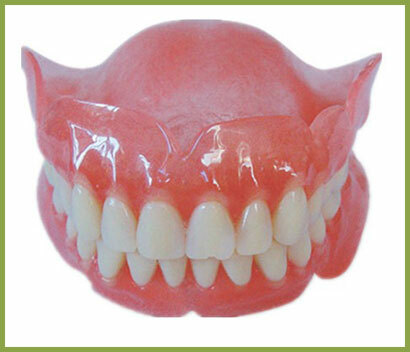 We are here to address any concerns you may have about Dentures.